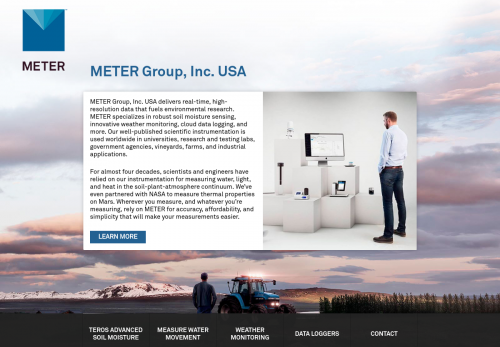 METER Group, Inc. USA delivers real-time, high-resolution data that fuels environmental research. METER specializes in robust soil moisture sensing, innovative weather monitoring, cloud data logging, and more. Our well-published scientific instrumentation is used worldwide in universities, research and testing labs, government agencies, vineyards, farms, and industrial applications. For almost four decades, scientists and engineers have relied on our instrumentation for measuring water, light, and heat in the soil-plant-atmosphere continuum. We’ve even partnered with NASA to measure thermal properties on Mars. Wherever you measure, and whatever you’re measuring, rely on METER for accuracy, affordability, and simplicity that will make your measurements easier. Advanced soil moisture sensing. A complete soil moisture system that treats the whole accuracy problem by eliminating common problems that cause uncertainty in the data—things like sensor-to-sensor variability, air gaps, or preferential flow. If you want accurate soil moisture, everything comes down to installation. We engineered this tool for faster and more accurate water content sensor installation. To say it’s easy and affordable would be highly accurate. It is incredibly easy to use. It requires little maintenance, and it’s accurate enough for most applications. The problem with most water depth, temperature, and electrical conductivity (EC) sensors is that their cost is prohibitively high. Not only that, but the measurement often requires you to purchase an extra sensor to make a barometric pressure reading to correct for atmospheric pressure. You need a low-cost instrument that’s equipped with every sensor necessary for things like tracking changes in solute movement, measuring groundwater recharge, and studying surface water hydrology. You need the HYDROS 21. Designed by METER Group exclusively for Campbell Scientific. All your weather monitoring needs met with simplicity. It measures air temperature, relative humidity, vapor pressure, barometric pressure, wind, solar radiation, precipitation, and lightning strikes. There are moving parts, consumes little power, and has a built-in tilt sensor assures long-term data integrity. It is great for quick deployment, for remote locations, large networks, complex systems, and more. An Ultrasonic Anemometer that’s accurate at any wind speed because there aren’t any moving parts that cause friction or fail. It’s inexpensive and has a low-energy design. Accuracy. Dependability. Affordability. With the ZL6 data logger, there are no limits. That’s because we’ve reinvented the entire METER data logging system so the ZL6 can be your ultimate research partner. Easier, more advanced, and more robust, the ZL6 introduces cloud-based data delivery, Bluetooth® configuration, GPS, firmware-over-the-air updates, and integrated metadata. A web-based application to remotely download spreadsheets, view data, and configure compatible loggers like the ZL6. Please fill out the form below and Varysian will enable communication with METER Group, Inc. USA.